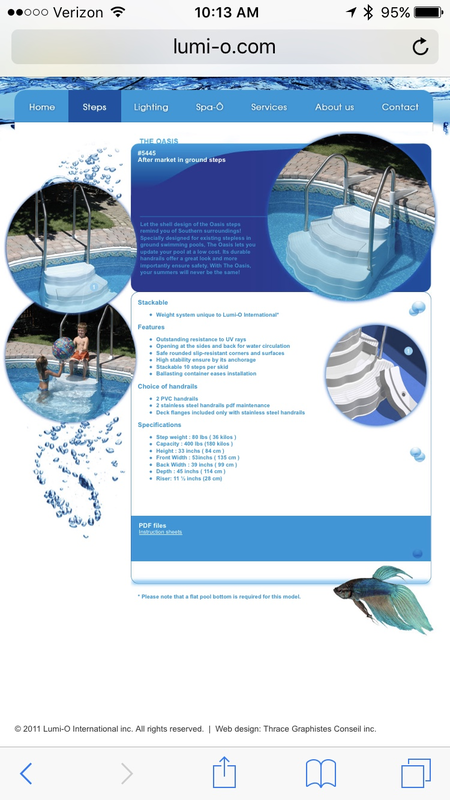 I'm looking for advice and recommendations for drop in style steps for an inground pool. Does anyone have these that they've been happy with? I'm a new owner and there was a set with the house but I gave them away because they were pretty beat. The liner is only 2 years old so Installing new stairs is out of the question for now. So like wedding cake stairs? Or a ladder? I have wedding cake stairs and it's been great for the two years I've had them. The middle step holds 50 pounds of sand and I've had no issues with it moving at all. Our liner was put in right before we bought the house so I couldn't add steps either. Do you know the brand/model of the stairs? Mind sharing a pic? My steps are from Lumio or Lumi-O. I've got the cover on the pool but let me see if I can find the link online. These are mine, except mine have plastic rails instead of metal.